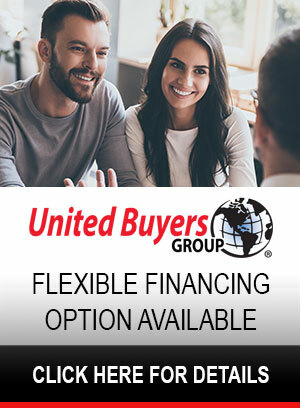 Providing the residents of Jackson CA, River Pines, Wilseyville, Lockeford, Pine Grove, Ione, Sutter Creek, Acampo, Rail Road Flat, Drytown, and the surrounding area in Amador & Calaveras Counties with the best selection of top rated gas fireplaces & custom gas fireplace designs. 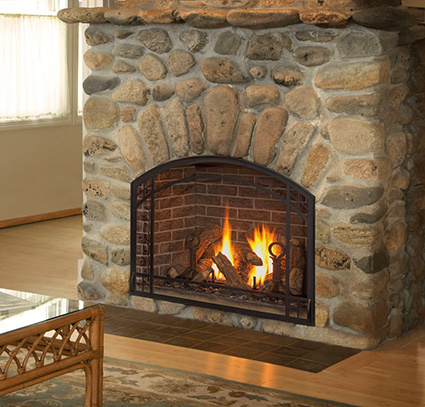 If you are one of those homeowners who loves the look & feel of a burning fireplace but hates the idea of starting and maintaining a wood fire, a gas fireplace could be the way to go. 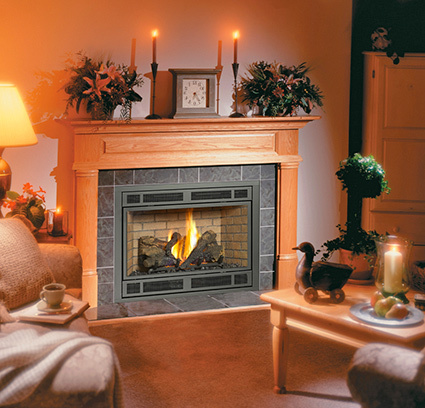 With a gas fireplace, whether you choose a modern unit or traditional design, will give you the ambiance & enjoyment of a wood burning fireplace without requiring the effort of cutting, stacking, & storing wood and maintaining a wood burning fireplace. Gas fireplaces also give you a great opportunity to zone heat your busiest spaces and lower your heating bill during the most demanding cold winter months. There are also a number of additional features and options to consider that only add the the beauty and convenience of these amazing fireplaces. The benefits of a battery-powered thermostat or multi-function remote control along with the impressive looking flames make a gas fireplace an excellent choice for discerning homeowners that demand ease-of-use and luxury. The technologically-advanced design of modern gas fireplaces includes built-in safety features that can ensure reliable performance. Features such as intermittent or standing pilot lights and sensors which detect heat, flame, and oxygen depletion help to maintain safe operation that everyone in the family can enjoy. Fireplace screens over the glass keeps little hands from touching the hot glass, and the direct-vent pipe releases all combustion by-products outside of the home. Gas fireplaces also offer a number of different options that can enhance their beauty and functionality. Fan speed, flame height, heat output, accent lights, and the pilot light can all be customized conveniently with the push of a button on your remote from anywhere in the room. Limited space - no problem! Gas fireplaces come in a range of sizes and finishes to meet your exact needs. Power outages are no problem; with battery-powered remotes and thermostats your gas fireplace will still keep your family warm when you need it most. For your dream cabin in the woods you can chose a fireplace with a rustic hand-hammered iron face, a stack of realistic logs and a big, beautiful fire to keep you warm on those cold winter nights. If sleek and modern is more your style you can have a long linear style fireplace with a full glass front and a dancing line of flame on a bed of glass. There are fireplaces perfect for keeping your bedroom nice and cozy or for warming your open great room. Come talk to our expert sales staff here at Sierra Hearth & Home, to get help choosing the fireplace that will fit your needs and enhance your home for years to come.